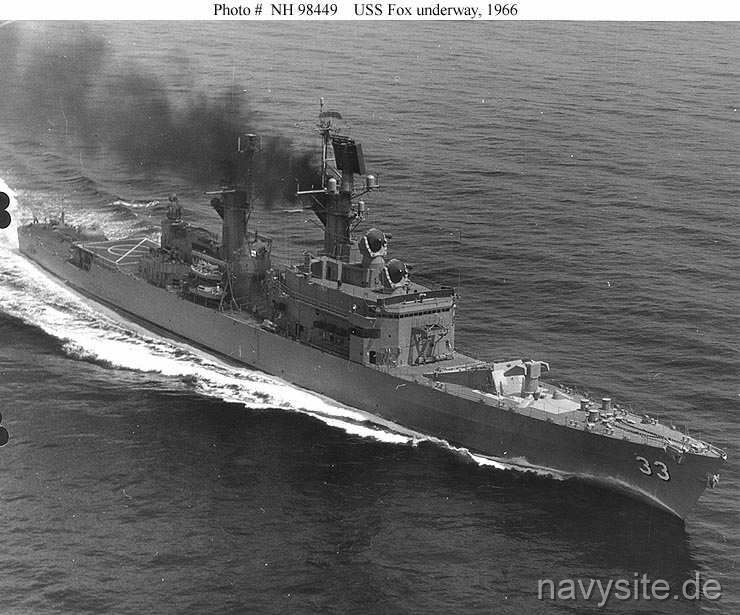 USS FOX was the eighth ship in the BELKNAP - class of guided missile cruisers. Decommissioned on April 15, 1994, after almost 28 years of service, the ship spent the following years laid-up at Suisun Bay, Benicia, California, as part of the Reserve Fleet. In 2006, the FOX was towed to Brownsville, Tx., for scrapping. USS FOX was last homeported in San Diego, Ca., and was the fifth ship of the name in the US Navy and the third to honor Gustavus Vasa Fox, Assistant Secretary of the Navy from 1861-1865. Builder: Todd Pacific Shipyards Co., Los Angeles Division, San Pedro, Ca. This section contains the names of sailors who served aboard USS FOX. It is no official listing but contains the names of sailors who submitted their information. 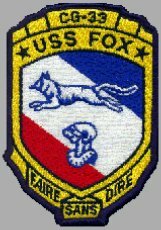 Click here to see which USS FOX memorabilia are currently for sale on ebay. The motto is one associated with the English branch of the Fox family and dates back to the early 19th century. Literally translated, it means: "To do without saying"; freely translated, it might be rendered as: "Action without words": The sense is considered fitting for a ship of war and particularly symbolic of the capability of FOX. The colors of the shield are those of the national Ensign, symbolic of courage, loyalty and honor. Moreover, they are the colors of Gustavus Vasa Ericcson, King of Sweden in 16th century, to whom it is believed Secretary Fox traced his lineage. The running fox and battle helmet are an adaptation of the heraldic device on a coat of arms of the English branch of the Fox family. The fleet fox is symbolic of the speed, agility, and cunning that characterized the ship. The knight's helmet represents FOX's military purpose and readiness and the closed helm reiterating the purport of the motto. 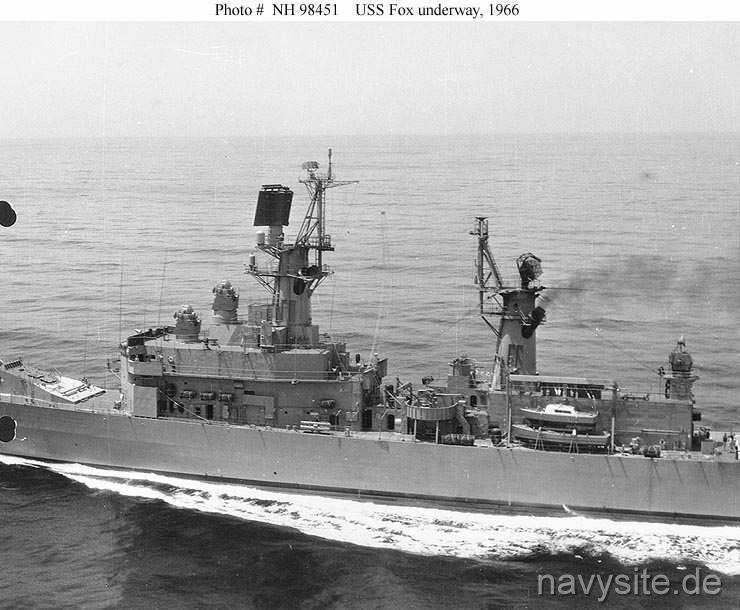 USS FOX, built at San Pedro, California, was commissioned in May 1966. 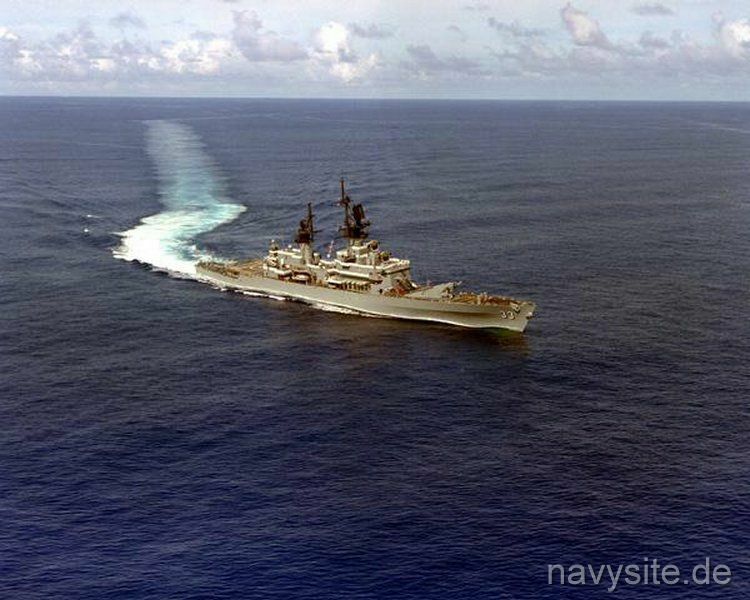 Following a year of outfitting, evaluation work on her advanced weapons systems and training for her crew, in June 1967 she began the first of well over a dozen overseas deployments. For nearly the rest of that year she served in the Western Pacific, mainly taking part in Vietnam War operations. Among her activities were control of air traffic, including guiding U.S. fighter airplanes in successful combat with enemy MiGs, and search and rescue efforts by a helicopter based on her deck. FOX also helped USS FORRESTAL (CV 59) when that big aircraft carrier was ravaged by fire on 29 July 1967. During the remainder of the Vietnam War era FOX made four more WestPac cruises (October 1968-March 1969, June-October 1970, August 1971-January 1972 and January-July 1973), performing much the same tasks as during her first. Her 1970-1971 tour also took her into the Sea of Okhotsk, an area of increasing interest as the Soviet Union expanded its naval power at the height of the Cold War. 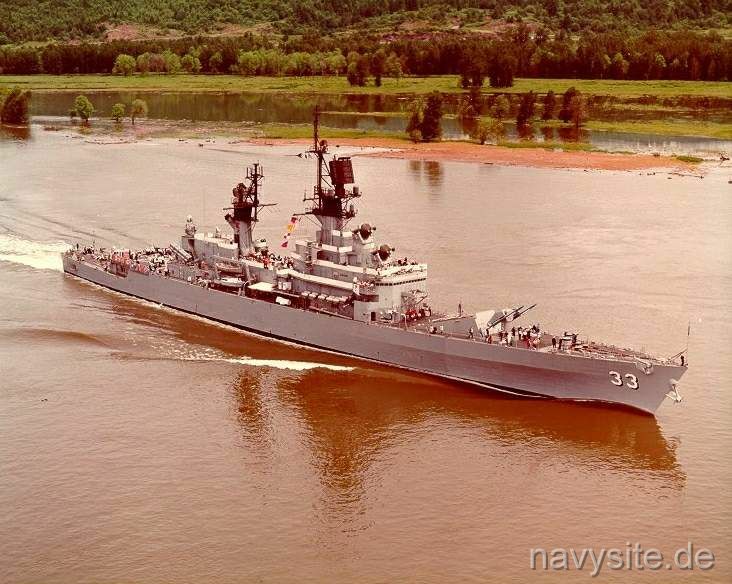 More than two years in the U.S. West Coast region followed during which, at the end of June 1975, FOX was reclassified as a guided missile cruiser, with the new designation CG 33. FOX steamed westwards again late in 1975 for a deployment that was mainly spent in the Indian Ocean. 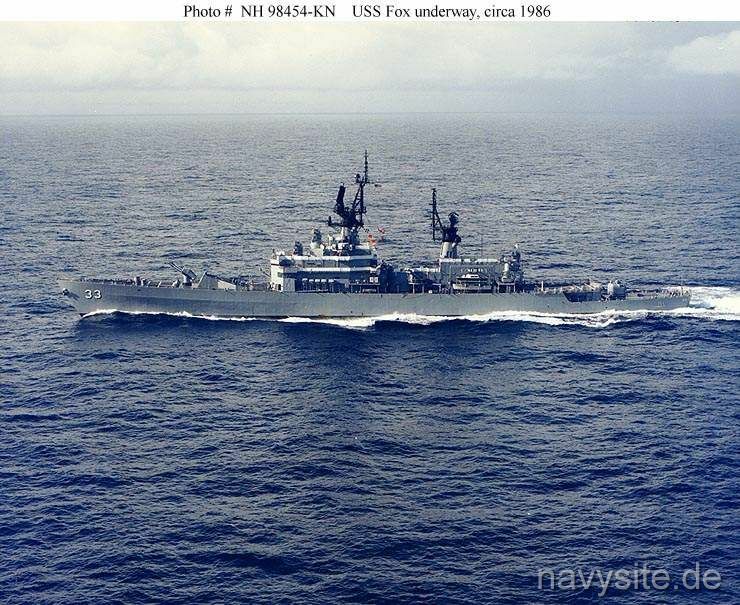 She exercised with the Australian and Iranian navies, kept an eye on Soviet naval activities and called on several nations before returning home in mid-1976. For the rest of her career, the cruiser was a frequent visitor to the Western Pacific and Indian Ocean. 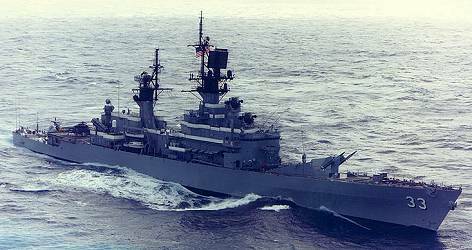 Her cruise there in January-June 1978 included operations in the Red Sea and another passage through the Sea of Okhotsk, while that in September 1980-April 1981 featured a spell as flagship in the Persian Gulf during a severe crisis in U.S. relations with revolutionary Iran. 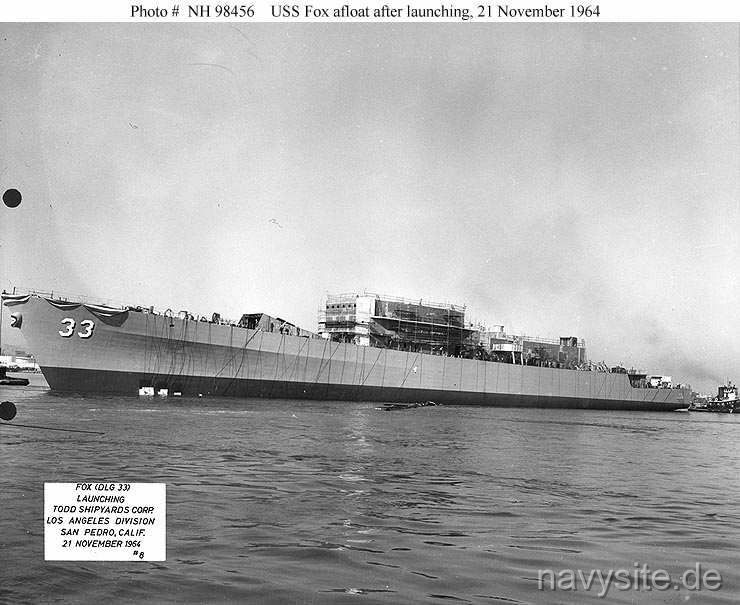 Between those tours FOX was modernized, receiving Harpoon surface-to-surface guided missiles in place of her three-inch guns, plus other upgrades to her combat capabilities. Further WestPac/IO deployments took place in 1982 (during which she helped rescue more than a hundred Vietnamese refugees), 1985-1986, 1987 (including protecting Persian Gulf shipping during heavy fighting between Iran and Iraq), 1988-1989, 1991-1992 and 1993. FOX concluded her last overseas cruise near the end of 1993 and immediately began inactivation preparations. Decommissioned in mid-April 1994, she was sold for scrapping in 1995. However, the troubled state of the U.S. shipbreaking industry in the 1990s caused her to be repossessed. Born in Saugus, Massachusetts, on 13 June 1821, Gustavas V. Fox entered the Navy as a midshipman in 1838. He served in cruising warships, including Commodore Perry's squadron during the Mexican War, the Coast Survey, and finally commanded U.S. Mail steamers plying the Atlantic coastal routes. Resigning from the Navy in 1856, he entered business in Lowell, Massachusetts. At the onset of the Civil War, he volunteered for service and received a temporary appointment as a Lieutenant in the Navy. In April 1861, he was dispatched in the steamer BALTIC to relieve Fort Sumter; before he could land his embarked troops, the Confederate bombardment began and, after the surrender of the fort, he coukl only transport the remnants of Major Anderson's command back to New York. He was appointed Chief Clerk of the Navy Department in May 1861 and at President Lincoln's insistence the office of Assistant Secretary of the Navy was created for him by an act of Congress in August 1861. Fox was a forceful, outspoken individual with considerable experience in oceangoing steamships and he soon gained Lincoln's confidence. By sheer force of personality, he rose to a dominant position in the direction of naval affairs within the Department; similarly, his influence in government circles afforded him a major role in the tactical as well as strategic direction of the naval aspects of the Union war effort. He was a powerful champion of the controversial inventor John Ericcson and the equally controversial monitor-type of ironclad. Whatever the merits of the latter in the context of the times, it may now be noted that the concept soon led to the generally accepted practice of concentrating a ship's firepower in a small number of large guns mounted in revolving armored turrets and hence the battleships and cruisers of a later day. 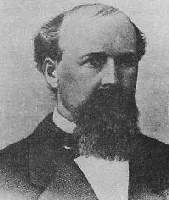 Fox resigned from his position in 1866 to represent the President on a special mission to Russia. Characteristically, he made the voyage in the monitor MINANTONOMAH, the first ship of the type to cross the Atlantic. He then returned to business in Lowell, Massachusetts and resided there until his death on 29 October 1883. The photo below was taken and contributed by Michael Martin. 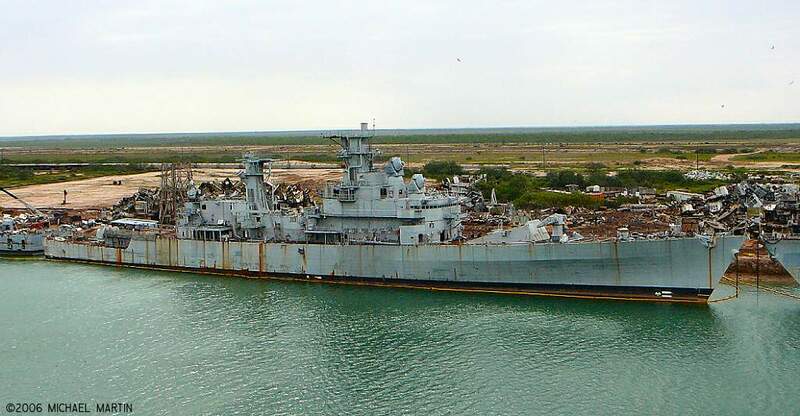 It shows the FOX being scrapped at Brownsville, Tx., in 2006. The photo was taken on October 25, 2006.